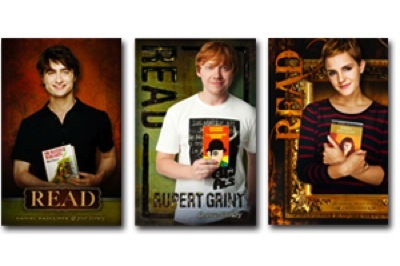 Harry Potter stars Daniel Radcliffe, Emma Watson, and Rupert Grint are featured on a new trio of American Library Association READ posters. They are each holding their favorite book–Radcliffe holds Mikhail Bulgakov’s The Master and Margarita, Watson has Shakespeare’s Romeo and Juliet, and Grint holds A Clockwork Orange. And there lies the controversy. The posters are available for pre-order in the ALA store until October 15th. You can try to win one of the posters or another prize by answering Harry Potter trivia questions on the ALA Graphics Facebook page. Harry Potter and the Deathly Hallows, the first of the two part finale, will be in theaters on November 19th.